How Long Should Kids Stay in Booster Seats? Amy Sutton began writing professionally in 2010. The majority of her work has been published on fitness, health-related and parenting websites. Sutton is well-versed and passionate about parenting, fitness and health issues. Being a parent comes with all sorts of things to think about when it comes to your child's safety. One way to keep kids safe in the car is by ensuring your child is properly buckled into the car seat that's recommended for her age. A booster seat is a type of car seat that's recommended for kids that meet certain age, weight and height requirements, according to HealthyChildren.org. In 48 states, along with Puerto Rico and the District of Columbia, booster seats are required by law for kids who have outgrown their car seats, but don't yet meet the requirements for riding with an adult seat belt alone, according to the Governors Highway Safety Association. As of 2013, South Dakota and Florida are the only states without this law. Children can move up to a booster seat when they exceed the weight or height recommendation of their car seat and weigh over 40 pounds, states the Washington State Booster Seat Coalition. The age at which a child can graduate from a booster seat to a seat belt varies by state. The American Academy of Pediatrics recommends that kids remain in a booster seat at least until they are 8 and reach 4 feet 9 inches tall. Car accidents are the leading cause of death for children, according to the American Academy of Pediatrics. Using a booster seat or another appropriate safety seat can protect children in a crash, reducing the risk of injury or death. When kids ride in a booster seat, it raises them up to the proper height, so that their seat belt is positioned safely across the chest and not on the neck. It also holds the lap belt down around a child's hips instead of across the abdomen, where it can cause injury in a crash. Choosing a proper booster seat is important. It must meet or exceed Federal Motor Vehicle Safety Standard 213, according to Kids Health. Never use a booster seat that's in poor condition or one that's been in any type of accident, no matter how minor. Ensure the seat you select is less than six years old and comes with an instruction manual. There are several types of boosters to choose from, according to the Washington State Booster Seat Coalition. 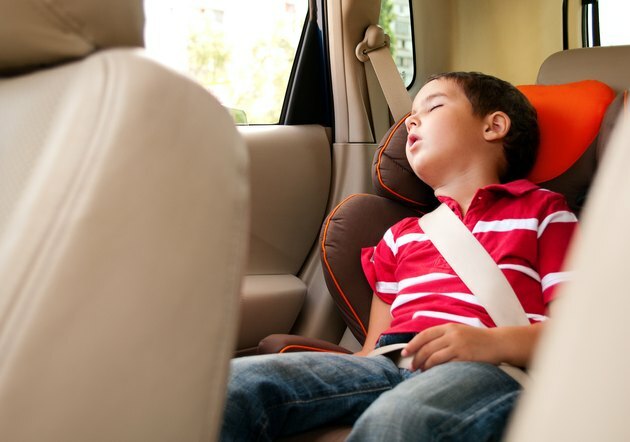 A no-back booster has only a seat and must be used in a car that has headrests above your child's ears. A high-back booster seat has both a seat and back , which can help protect against whiplash in an accident. It is also more comfortable, for when kids fall asleep when you're driving. A forward-facing or combination seat is a car seat and booster seat in one, that can usually be used from the time your child reaches 20 pounds. After selecting the best booster for your child, it's equally important that you install and use it properly. Before getting started, read the entire instruction manual that came with the seat. Position the booster seat in your vehicle flat on the car's seat and have your child sit in it. Bring the vehicle's seat belt across your child's body and buckle it. Adjust the seat belt so that the lap belt portion fits snugly across your child's hips and not the stomach. Position the shoulder belt across the chest, so that it's not sitting on your child's neck. If you're unsure about how to use your child's booster seat or you just want to have it inspected by an expert, you can find inspection locations at Seatcheck.org. High Back Booster Seats or Booster Seats with No Back?